Commissioned exclusively by Buckingham Palace, this exquisite fine bone china side plate celebrates the 70th birthday of HRH Prince Charles, The Prince of Wales. Made in the UK, this official royal commemorative plate features a new commemorative coat-of-arms featuring the Duchy of Cornwall shield with the Prince of Wales Red Dragon badge and daffodils (the national flower of Wales) beneath the Prince of Wales feathers. The border features botanical motifs representing the Prince's diverse interests. HRH Prince of Wales (Prince Charles) was born on 14th November 1948, the eldest son of HM Queen Elizabeth II and HRH Prince Philip, The Duke of Edinburgh and is heir to the British throne. Prince Charles' official titles include The Duke of Cornwall, Duke of Rothesay, Earl of Carrick, Baron Renfrew, Lord of the Isles, and Prince and Great Steward of Scotland. This royal commemorative collection is handcrafted from fine bone china in the UK's famous Staffordshire potteries for Buckingham Palace. The regal design is finished in red, blue and gold and features a unique coat of arms painted specially to commemorate the occasion combining the Duchy of Cornwall shield, The Prince of Wales Red Dragon badge and Welsh daffodils, topped by The Prince of Wales feathers. 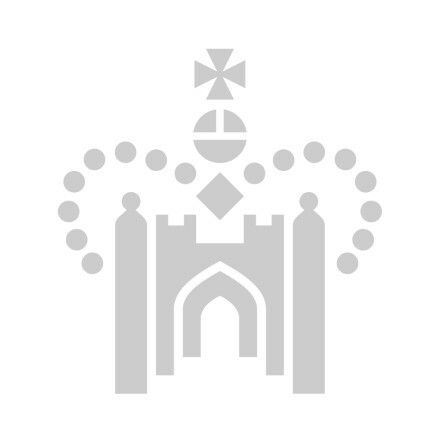 The plate's decorative border features a garland of grasses, leaves and daffodils around the royal crown, botanical motifs representing Prince Charles's many and diverse interests. Care of your commemorative plate: Hand wash only, not suitable for dishwasher or microwave use.